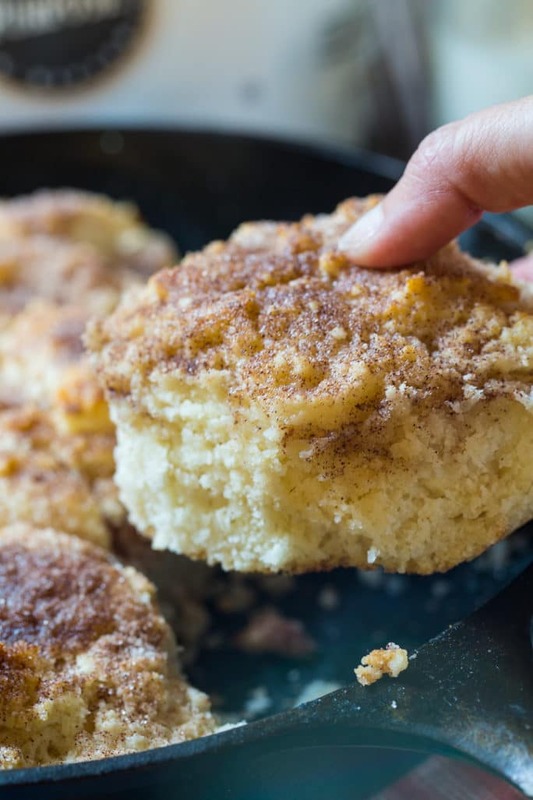 Skillet Snickerdoodle Biscuits are extra fluffy and light with a cinnamon/sugar coating on top. They are just the thing for celebrating National Biscuit Month. With a little melted butter brushed on top, these biscuits taste incredible warm from the oven. 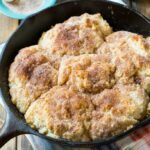 This Skillet Snickerdoodle Biscuits recipe is super easy and produces really tall and light biscuits with a tender texture. And best of all? No need to roll out the dough. The dough just needs to be scooped and dropped into a cast iron pan. A short 20 to 25 minutes in the oven and you have 6 humongous biscuits that would be perfect for breakfast, brunch, or a snack. 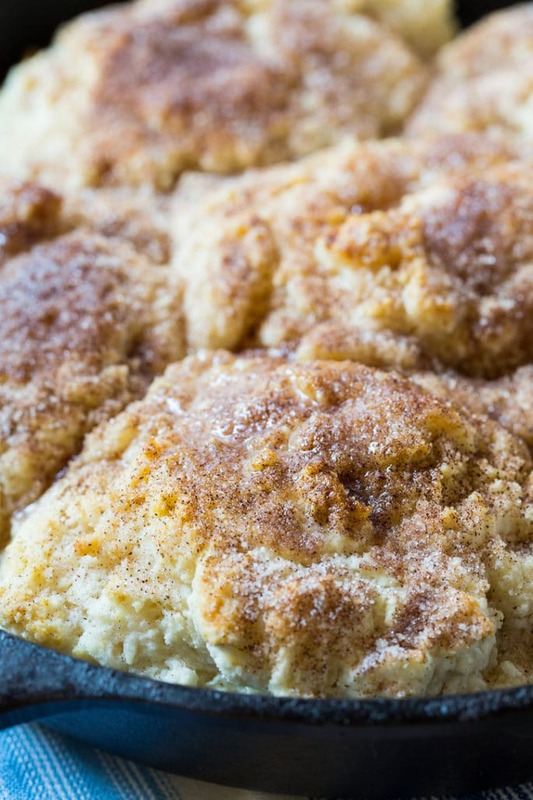 The secret to these super fluffy biscuits? Good biscuits start with the flour. 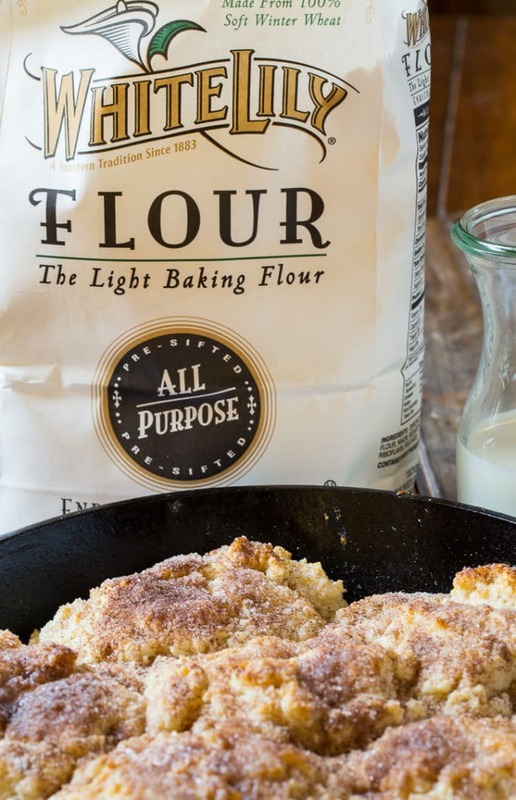 For truly southern biscuits with a light and fluffy texture, you need to use White Lily flour. Made from soft winter wheat, White Lily® flour has a lower protein content than other all-purpose flour. You can feel the difference just by running White Lily® flour through your fingers. It has an extremely fine, almost silky texture. White Lily® flour can be hard to find outside of the southeast but it can be ordered on Amazon or from the White Lily website. Just look at the difference between these biscuits! The biscuits on the left were made with White Lily® flour. 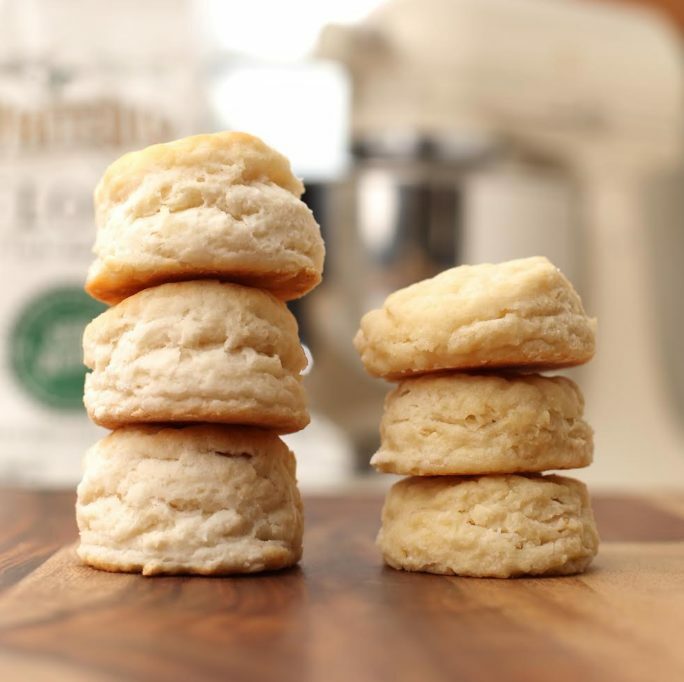 Typically I would use White Lily® Self-Rising Flour for making biscuits because it is so convenient and save a step. For this recipe however, I used All-Purpose flour and added baking powder and baking soda. In addition to White Lily® flour, I used a combination of butter and shortening to produce biscuits that are both buttery and tender. Since the goal is fluffy biscuits, instead of flaky, there’s no need to chill the butter and shortening. Use the shortening at room temperature and let the butter soften some. Then it is super easy to work into the flour. 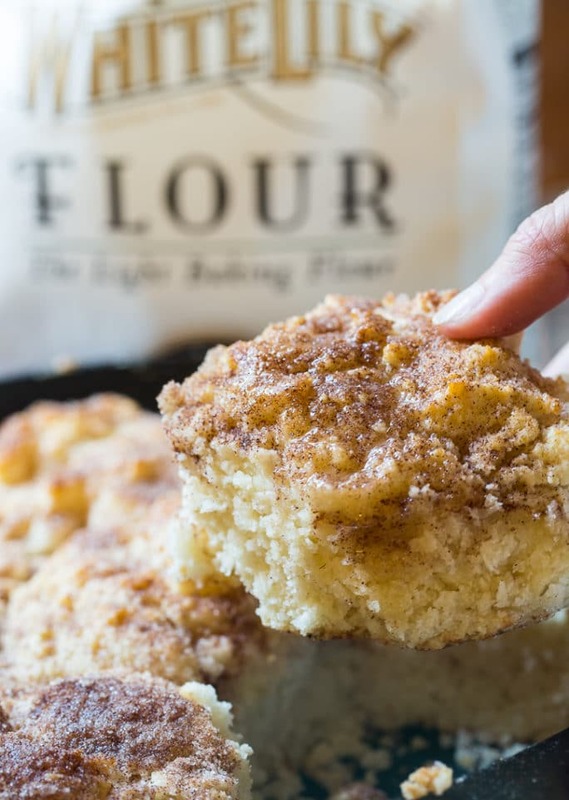 To give these biscuits even more snickerdoodle flavor, try adding cinnamon baking chips to the dough. 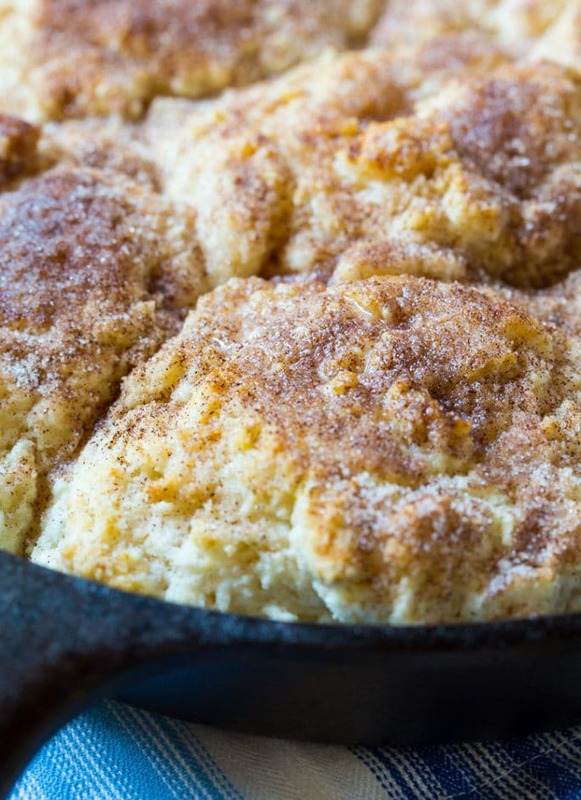 A little butter on top makes these biscuits taste divine! Preheat oven to 425 degrees and grease a 9-inch cast iron pan. If you don't have a cast iron pan, use a 9-inch cake pan. In a large bowl, whisk together flour, baking powder, baking soda, salt, and 1 tablespoon sugar. Scatter butter and shortening pieces on top and use your fingers to rub the butter and shortening in until it resembles coarse meal. Stir in buttermilk until combined. Spray a 1/2 cup measuring cup with cooking spray and scoop and drop 6 heaping mounds of dough into prepared pan, placing first one in the middle and the others in a circle around it. Combine 1/4 cup sugar and cinnamon in a small bowl. Sprinkle half of sugar mixture on top of biscuits. Bake until golden brown on top, about 20 to 25 minutes. Brush tops with melted butter and sprinkle remaining sugar mixture on top. This entry was posted in Breads and Muffins and tagged biscuits. Bookmark the permalink. If I use the self rising flour can I omit the baking soda and baking powder? Hi there, is the flour you used Bleached or Unbleached? And what is the difference? Where do u purchase Lily Flour? Which state do you live in Virginia? It’s widely available in the southeast. You can also find it on Amazon. Oh man — I wish I had a skillet full for breakfast! These look SO good and just the perfect amount of sweetness! God Gracious ! This is what I call The Breakfast ! Thank you for sharing this recipe with us ! Oh gosh these biscuits! What I would do for one right now! haha I loveeee cinnamon sugar on anything and everything! These biscuits look amazing, Christin! 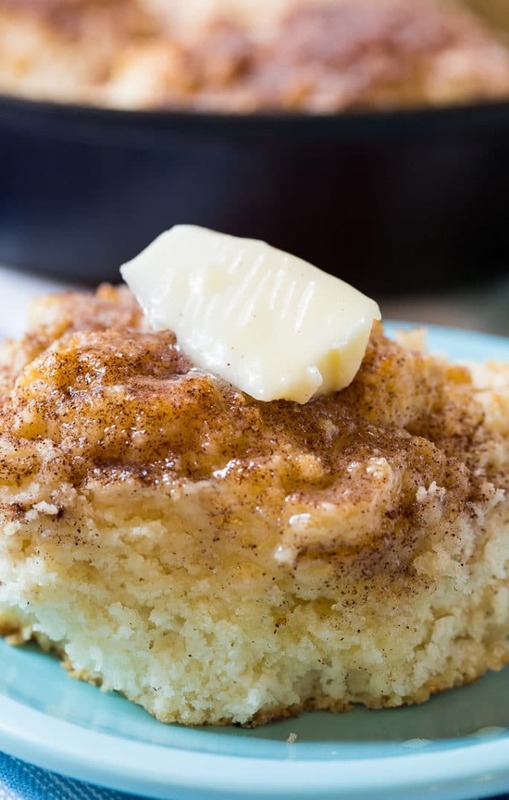 Snickerdoodles are my favorite cookie, so I can only imagine how delicious biscuits are when topped with cinnamon and sugar. And I love that you made it in a skillet, too!